Motrin 50 Count - 2 packs. 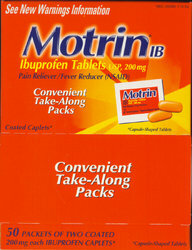 Easily reduce you pain, while at work, with this convenient dispenser pack of Motrin. Each dispenser box has 50 packets of 2 coated 200 mg Ibuprofen caplets. The box will easily store in a cabinet or drawer. Motrin 50 Count - 2 packs. Each dispenser box contains 50 packs of 2 coated 200 mg Ibuprofen caplets. Easily store it with your First Aid supplies at work.